From the #1 New York Times bestselling author of "If You Give a Mouse a Cookie" comes the story of Max, a lovable and determined puppy with a lot to learn on his adventure of becoming someone's life-changing friend and helper. Max's puppy raiser, Sam, takes him everywhere; on the bus, to puppy kindergarten, and even to restaurants. But it's tough staying underneath the table when the french fries smell so good! 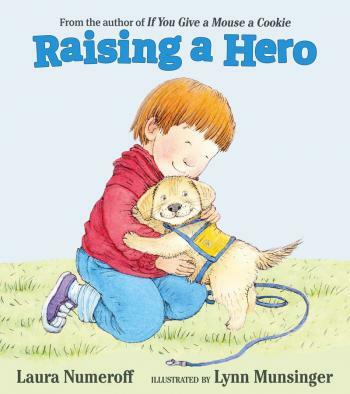 Discover all the fun and important ways Max earns his special yellow vest as he and his puppy raiser, Sam, work together to help someone in need of a true hero. Laura Numeroff is the New York Times bestselling author of "If You Give a Mouse a Cookie," "If You Give a Mouse a Brownie," and "What Mommies Do Best/What Daddies Do Best." She was born in Brooklyn, New York, and graduated from Pratt Institute. Laura grew up as the youngest of three girls, surrounded by art, music, and books. An avid animal lover, Laura has always wanted to write a book about service dogs. Lynn Munsinger is the New York Times bestselling illustrator of children's books including "What Mommies Do Best/What Daddies Do Best" by Laura Numeroff and "Tacky the Penguin" by Helen Lester. "Numeroff and Munsinger knocked it out of the park with "Raising a Hero!" This beautiful children's book teaches about the love, dedication and hard work that go into raising a service dog to help people with disabilities achieve independence. Proceeds from this book are going to one of my favorite organizations, Canine Companions for Independence, where the memory of our son Tommy Lasorda, Jr. lives on in a future service dog hero named 'Spunky.'" --Tommy Lasorda, Sr.